Biodiversity is high in the Caucasus Ecoregion. Landscape diversity and species diversity have been the focus of research in the last decades, yielding long species lists in both plant and animal taxa and a high landscape diversity with a very rich mosaic of ecosystems and habitats in this region. The most species-diverse terrestrial taxon are usually the arthropods, namely insects. Despite a good number of taxonomic and faunistic studies in the Caucasus Ecoregion, we have no precise knowledge on how many arthropod species to expect in this region, even less so concerning species diversity patterns across different habitats, ecosystems, regions or countries. Trends in arthropod diversity in the Caucasus Ecoregion remain unknown. 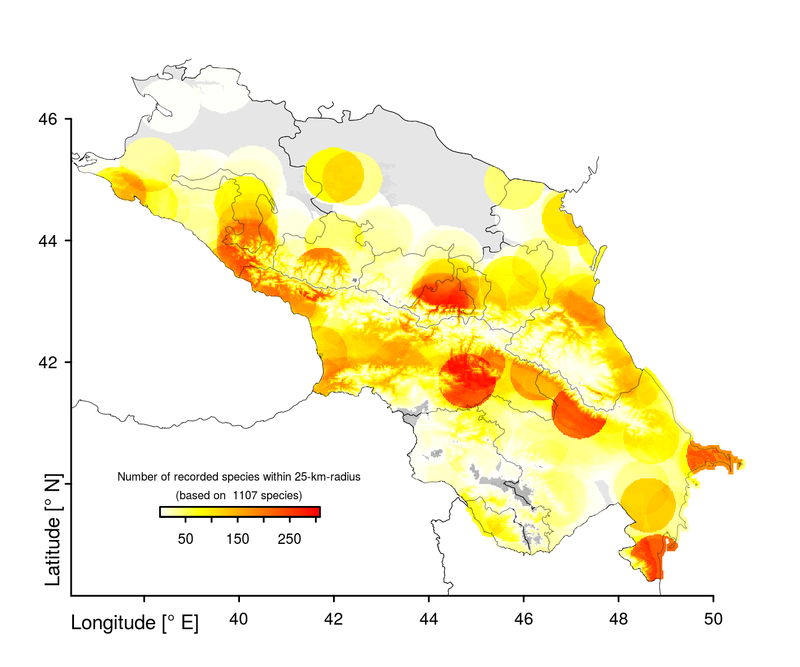 Density of spider records in the Caucasus Ecoregion; gray: no records within 25-km-radius; white: 1 record; darkest red: 308 records. An analysis of the species records in the Caucasian Spiders Database revealed that for most regions in the Caucasus Ecoregion not more than 100 species have been recorded and from some areas not a single spider specimen has ever been collected and published, e.g. the northern parts of Krasnodar Kray, Stavropol Kray, northwestern and western Armenia, regions within and west of Nagorno Karabakh and parts in southern Azerbaijan (see map). Hotspots of spider species records (red parts) merely reflect the favorite collecting destinations of arachnologists in the past and present, e.g. 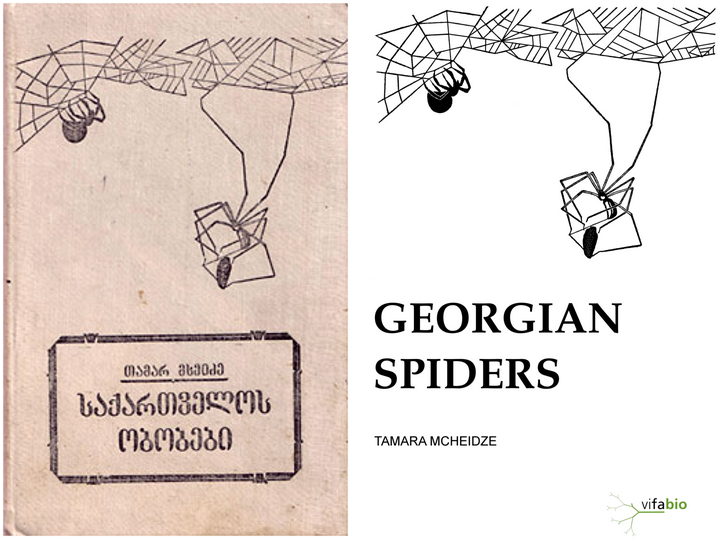 Tamara Mcheidze collected mostly in and around Tbilisi and Peter Dunin intensively studied the spider fauna of the Apsheron Peninsula around Baku. Almost nothing is known about the genetic diversity of the spiders in the Caucasus, but Krehenwinkel & Tautz (2013) presented one of the few studies with the first information on high genetic diversity in spiders of the Caucasus Ecoregion. 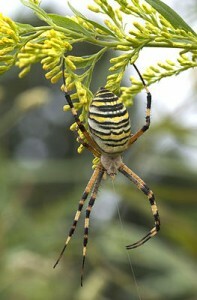 In their study populations of Argiope bruennichi (Scopoli, 1772) the Caucasus Ecoregion were the only populations — compared to populations in Europe, Russia and East Asia — with all haplotypes present, thus identifying this region as the probable refugial region for western European populations during glaciation events.